Oscar De La Hoya is talking big again – as in VERY big. The Golden Boy head spoke briefly with TMZ Sports, and the former multi-weight champ said that if Floyd Mayweather decides to return to the boxing ring and fight Canelo Alvarez for a second time, the rematch would generate, drum roll…….$1.5 billion! “If Floyd Mayweather decides to come back, a fight with him and Canelo could be a $1.5 billion fight,” De La Hoya said with a straight face. Now we all know Mayweather is THE undisputed Box-Office/Pay-Per-View king, with many of his fights doing huge, huge numbers, but over a $billion in revenue, really? The first fight between “Money” and Canelo, which took place in 2013, saw Mayweather pick up a monster $43 million pay day, but that number would be dwarfed in a return fight, according to De La Hoya. Yes a return fight between these two genuine superstars would be bigger than the first fight (and maybe, in fact likely, a far more competitive fight this time round; what with Canelo getting better and better at age 28 and Floyd now well into his forties), but no way would it pull in over a $billion in revenue. Would a rematch between these two even top the Pay-Per-View record currently held by the Mayweather/Manny Pacquiao fight? “I would love to have the opportunity to avenge that defeat,” the world middleweight champion said. But would Mayweather risk his perfect 50-0 record at this late stage of his career? Up at 160 pounds, with no catch-weight demands in place, Canelo would very likely be too strong, too determined and too young for Mayweather. No, if Floyd wishes to pick up another massive, massive payday for a “real” fight, instead of another cynical exhibition bout, he will take that return with fellow veteran Pacquiao instead. 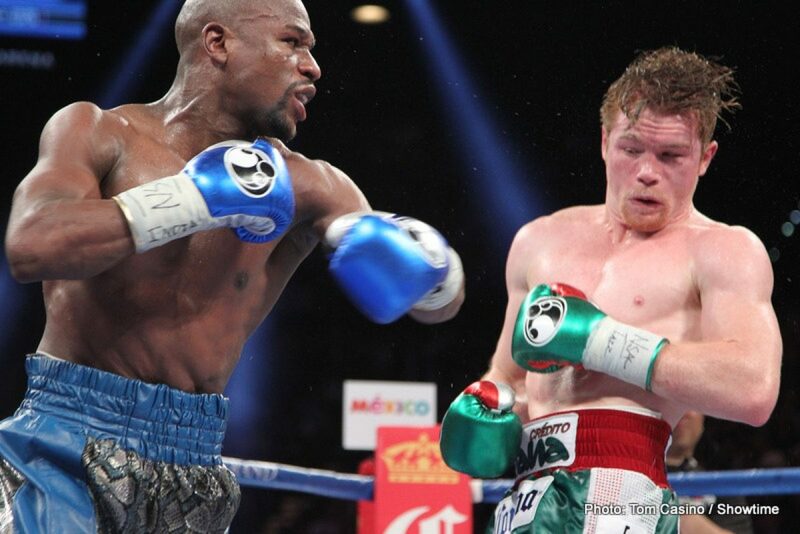 No way does Mayweather tangle with a matured, experienced and peaking Canelo. Still, Oscar always thinks big. Very big. You are here: Home / Boxing News / WATCH: Oscar De La Hoya Says A Mayweather/Canelo Rematch Would Be A $1.5 Billion Fight!